I always find February to be the hardest month of the year. It’s freezing cold, you’ve spent all your time and money on holiday gifts and food in December and you’re trying to lose all those extra holiday pounds. I’m hoping I helped you lose some of those holiday plans in January with my Whole30 month. So, now let’s work on gaining time, money and staying warm with a week of budget friendly, soul-warming foods! Try to use eggs, beans, pasta, rice, oatmeal and seasonal fruit/veg to save the most on your groceries. Canned food is a cheaper option than fresh for veggies, especially when it comes to tomato sauce. Canned crushed tomatoes with basil taste the same as expensive jarred tomatoes and taste the same. Buy store brands when you can. Make whatever you can from scratch (like crackers, snacks etc…). It will be cheaper than buying them. And make bread – it’s incredibly cheap. Shop the circular at each store to find the best prices. Often, they put basic ingredients for recipes, like lasagna, on sale at the same time. If you need meat, shop different cuts than you normally would – for example, thighs are always cheaper than breasts for chicken. Same for ground meats vs. whole cuts. And a whole chicken is the least expensive per pound and you can use in so many ways. If you can buy in bulk, it will be cheaper in the long run. You’ll be buying a lot upfront though, so keep that in mind in the short term. Each recipe below is about $5 or less and my total shop for the week from our local Shoprite was under $100. 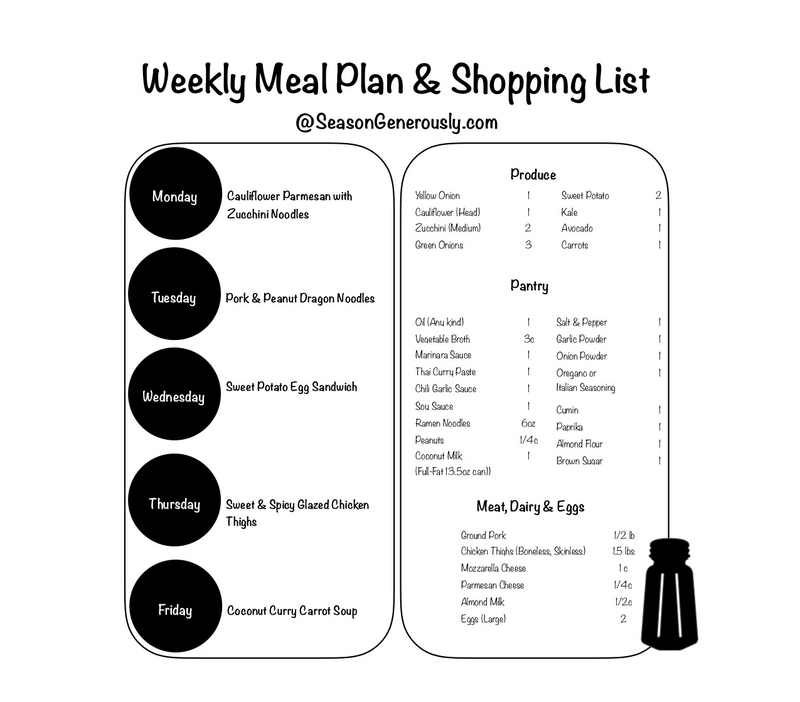 Click here for this weeks Budget Bites meal plan and shopping list or the picture below!